We’d love your help. 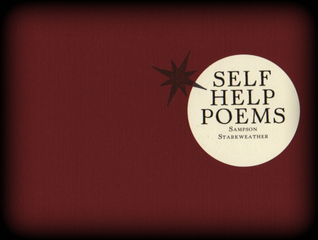 Let us know what’s wrong with this preview of Self Help Poems by Sampson Starkweather. To ask other readers questions about Self Help Poems, please sign up. I’ve always said Mike Tyson is my favorite poet. He was on Charlie Rose last night; he’s 42 years old now. At one point, when Charlie and some indie director were talking about art, he just blurted out the word “malice” out of nowhere, as if it was something he had been thinking about for years, and just remembered. Everyone at the table looked as if they thought their life might be at stake. Mike leaned back and smiled. There is such a thing as genius of experience, the genius of victimhood, th I’ve always said Mike Tyson is my favorite poet. He was on Charlie Rose last night; he’s 42 years old now. At one point, when Charlie and some indie director were talking about art, he just blurted out the word “malice” out of nowhere, as if it was something he had been thinking about for years, and just remembered. Everyone at the table looked as if they thought their life might be at stake. Mike leaned back and smiled. There is such a thing as genius of experience, the genius of victimhood, the genius of shame. Then again, a man ain’t nothing but a man.